Altman is president of Social Security Works; Benesch is communications director for the group. They recently wrote the piece “The GOP’s tax cut bonanza is a major attack on Medicare,” published by Salon. The piece states: “Do you trust Paul Ryan to protect your Medicare benefits? 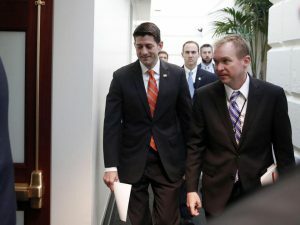 How about White House budget director Mick Mulvaney, a former member of the House Freedom Caucus, and like Ryan, a longstanding foe of Medicare? “If the just-passed House tax bill, its Senate counterpart or some compromise of the two is signed into law, the enactment will put Medicare’s future in the hands of Ryan and Mulvaney. “According to the Congressional Budget Office, the GOP tax bill will instantly trigger $400 billion in automatic cuts to Medicare in the next 10 years, including $25 billion in the first year after enactment alone. “These cuts are the result of a law known as Statutory PAYGO. That law requires an automatic cut in spending when Congress increases the deficit. The tax bill is, in Donald Trump’s words, ‘a big, beautiful Christmas present’ — for Trump’s family and other billionaires. If the Republicans are successful in passing a tax bill that increases the deficit by $1.5 trillion, as they intend, the provisions of PAYGO will be activated. “To be clear: If the tax bill passes the Senate and is signed into law by Trump, nothing more needs to be done to cut Medicare. If the House and Senate do nothing, the cuts take effect immediately after the end of the congressional session and get bigger every passing year. A vote for this tax bill is a vote to cut Medicare.